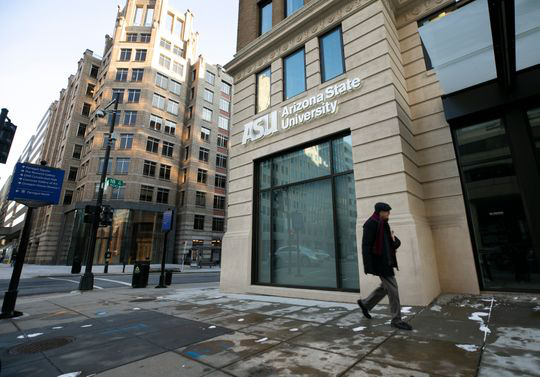 Arizona State University Expands in D.C.
Arizona State University (ASU) has rented more space to its Washington, D.C. operations after a newly debuted renovated building near the White House less was not large enough for the university. The Arizona Board of Regents recently approved a 10-12 year lease for an additional 8,400-square-foot space in a nearby facility, according to AZ Central. However, the university will have the option to end the lease after the fifth year. The newly renovated building, named the ASU D.C. outpost is located at I Street and 18th Street NW. The newly leased facility is located across the street. According to ASU board documents, the McCain Institute for International Leadership, the Sandra Day O’Connor School of Law and Walter Cronkite School of Journalism and Mass Communication experienced an increase in student enrollment over the last year. University officials are not yet certain about which programs will move to the newly leased space across the street.